Is losing bad after all? We were born in a society when winning has taken an important place in our lives. 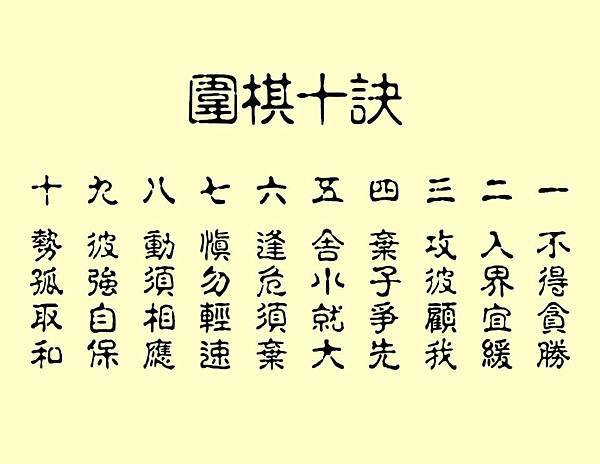 I think it is good to study and understand this since this is the first commandment in Weiqi. Winning is good in many ways but it may not mean good in some sense. Winning is good, but if indulge in over-dosing of winning pills, it does harm instead. I would say that if a person enters into a winning streak, he builds up a tendency that he does want to lose to anyone the next time. This closes the person’s emotion and hinders his personal and social development. This is no longer positive attribute in winning. The game of Weiqi is about balance, not just on winning. So what are the “rewards” of losing? Next time when you lose, it is alright. Enjoy the hidden learning process. And when you win next time, you will know that have gone through the learning stage and will continue to learn even by losing. Win with humility, lose with grace. I am at all costs not saying winning is no good, what i am trying to say is that we must always stay in balance, be humble at all times, knowing the pitfalls of winning and understand the benefits of losing too. Always remember this truth, no one in this world will ever be at the top forever. Our history factually proven this statement. If we are not ready to lose, we are heading for a great emotional pain. Losing is inevitable. 胜败乃兵家常事, no big deal to lose. If you lose, it is OK, be content and happy in yourself, and know that you will win someday if you keep learning and learning. You will get better if you do not give up. Be ready to lose a game or a few with grace. This instruction is not a suggestion, it is a wisdom for life. – Thomas John Watson, Sr., the Founder of IBM. Hand-talk, Sit-Still, and Trouble-Forgetter, are just a few nicknames for Go. In Shi Shou Xin Yu, Wang Zhong Lang (424 AD) referred to Go as Sit-Still, and Zhi Gong referred to Go as Hand-talk, (the term Hand-talk is still widely used nowadays as in the computer Go program). Zu Na of Dong Jin (317-420 AD)refers to Go as Trouble-Forgetter. Zu Na’s younger brother Zu Di was defeated in his effort to invade the northern kingdom, and Zu Na was saddened greatly. He spent his time playing Go all day, trying to forget this mishap. His friend, Wang Yin urged him not to waste his time. Zu Na replied, “I just want to forget my trouble!” To Zu Na, this was a sad experience. However, most people who are not familiar with history, have the impression that he had a wonderful life playing Go, not being bogged down by daily affairs. Go, being considered as one of the four accomplishments by scholars and officials alike, is a great treasure of the Chinese culture. There have also been numerous inspiring Go related stories passed on from generation to generation. 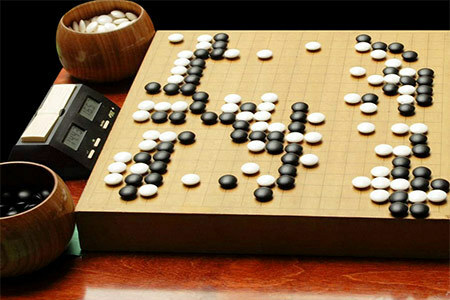 Especially during the Jin and Nan Bei Dynasties, there were numerous renowned Go players, and Go was very popular. People sitting still in front of the Go boards could be seen everywhere, with stones in their hands, talking leisurely to their opponents. Jin Shu, in Fei Xiu Zhuan, mentioned Fei Xia’s conduct in a Go related story. One day, Fei Xia was playing Go at a dinner party in the house of general Zhou Fu. Zhou got drunk and knocked Fei over onto the ground. To many people’s surprise, Fei got up and returned to the game as if nothing had happened. Of course this might not be due entirely to Fei’s good conduct. Go is known to have a mesmerizing effect on people to the point that they are not aware of what’s happening around them. Known as a member of the Seven Bamboo Sages, Yuan Ji was also a Go player. According to the legend, this person was totally mesmerized when playing Go. Jin Shou, in Yuan Ji Zhuan describes the scene when Yuan’s mother passed away while Yuan was playing Go with his friend. When his opponent heard that Yuan’s mother had died, he urged Yuan to stop the game, but Yuan insisted that they should finish. After the game was over, Yuan drank close to 20 liters of wine, let out a loud cry and vomited several liters of blood. This was a sad and touching story. Another story involves the two sons of Kong Rong during the Three Kingdoms (220-265 AD). As recorded in Wei Shi Chun Qiu, Kong Rong was beheaded by Cao Cao for saying the wrong thing. Kong’s sons were eight or nine years old then and were playing Go when the news of their father reached them. Still continuing with the game, their servants urged them to run for their lives. They replied calmly, “Have you heard of the eggs being spared when the nest breaks?” As a result, both of Kong’s sons were beheaded too. Yuan Ji tried to find a moment of peace of mind in Go and the two sons of Kung tried to grasp a short period of last minute joy in the game. But as far as humor is concerned, none compared to the story told in chapter 22 of Sui Jing Zhu. Yuan Lan (also known as Yuan Jian) was a judge in Kai Feng province at the time, who constantly invited friends over to play Go. One night, as Yuan Lan was playing Go, some pirates decided to rob the city. When the guards came to notify Yuan, he was so involved in the game that he ignored the guards. Being concerned, the guard raised his voice saying, “The situation is very tense outside with the robbery!” Yuan replied, “I have a robbery (the Chinese word for ko is the same as robbery) here too, and it’s also very tense!” This was indeed a funny story. Very few Go stories from the Wei (220-253 AD) Jin (265-420 AD) and Nan Bei Dynasties (420-589 AD) are humorous or funny. Most of the stories are sad like the following one. Following the two Jin Dynasties (265-420 AD) came the Liu Song period. Wang Huo was a scholar of noble character at that time, who was also a good Go player. Emperor Song Ming (Liu Huo) envied Wang’s fame and decided to kill him by sending him a bottle of poisonous wine. When the imperial edict and the poisonous wine arrived, Wang was engaged in a ko fight in a game of Go. After the game was over, Wang put away all the stones one by one before bowing solemnly to his game opponent and told him that the Emperor had ordered him to commit suicide. Picking up a cup of the poisonous wine, Wang said to his friend, “I would not recommend that you drink this wine.” He then drank the poison. What was Wang thinking about during the endgame? Maybe he wasn’t mad. Maybe he wasn’t even afraid. And, maybe he was simply thinking how he can gain an extra point in the endgame. Later on, Emperor Song Wei Zhong wrote in his poem, “Forget your troubles and enjoy Go” Maybe he never did understand what scholars of the Wei Jin Dynasties were thinking in their last games, but it’s quite appropriate in general. The cosmos is like a Weiqi board, The battlefield of Black and White – Trivial as worms and ants. Great as marquises and kings. These lines compare the Weiqi board to a battlefield, where straggles may be as petty as those between insects, or as great as those of nobles and kings. The human desire for competitive triumph is captured precisely in the action of a Weiqi contest. Don’t disturb true emotion with a mere game, Just let me follow the course and claim victory. Yet after the fighting, two boxes take back the Black and White, On the board then, where are the losses and gains? The tone of self-consolation suggests that the poem may have been written after Wang An-shih lost a game. The lines reveal that Wang An-shih played Weiqi merely for entertainment, as is vividly confirmed in an anecdote: “Wang An-shih’s Weiqi style was extremely low. When playing with other people, he rarely thought seriously and responded to rivals’ moves quickly and casually. When he felt he would lose, he would put his stones back in the box, saying: ‘I wanted only to soothe my disposition and forget my cares. Now, however, I cudgel my brains and labor my spirit. It would be better to stop here’.” It seems that Wang An-shih played only in lulls between his more important political activities. Victory is surely pleasant, / But defeat can also be enjoyed. Su Shih’s answer to the “flavor” question and is the thesis of the poem. Most players are elated upon winning and frustrated by a loss, but Su Shih says he is equally composed in victory and defeat. This appears to express his Taoist attitude. Su presents Weiqi as a microcosm of the human condition. Man occupies a universe in which he is moved by mysterious forces whose directions he cannot understand. When Su wrote this poem, he was defeated in the political arena. Banishment to Hainan Island meant humiliation and hardship, which was difficult for him to bear at first. But he was soon able to revive his spirits; as he put it: “I – an old man now – and my son Kuo, sitting face to face, are like two ascetic monks. But I feel transcendent and content in mind, and don’t change my demeanor.” This attitude allowed Su not only to survive the extreme hardships of the island but also to turn the three years he spent there into a productive period of creative and scholarly writings. Weiqi (or Go in Japanese) is the oldest and one of the most popular board games in China and other East Asian countries. Although the time of its origin cannot be set with certainty, reliable anecdotes about the game date back to 548 BC. The game spread from China to Korea and Japan before the Tang dynasty (A.D. 618-907), and in fact it is as Go, the Japanese pronunciation of the Chinese character ch’i, that the game is commonly known in the West. Weiqi is played with black and white pieces, or stones, on a square wooden board crossed by 19 vertical lines and 19 horizontal lines which form 361 intersections, or “points.” Players try to conquer territory by enclosing vacant points with boundaries made of their own stones, and by attacking and capturing hostile stones. The stones and board together account for both the simplicity and the complexity of the game: the two kinds of stones, black and white only, and the plainness of the rules of their movement, make the fundamentals easy to grasp; yet the large size of the board, with a wealth of combinations and an infinite variety of moves, demands extraordinary skill. The game requires years of practice and study for a player to become good even at the amateur level. The ingenuity and skill required made Weiqi not merely a pastime popular among nobilities and the intellectuals, but elevated it to a princely art form. Weiqi, Calligraphy, Painting, and the Qin, a seven-string plucked instrument similar to the zither, were regarded as the “Four arts”; attainment in all Four was a sign of high cultivation and social finesse. With its fusion of the intellectual and imaginative faculties, Weiqi offered particular inspiration and solace to poets. For instance, when Wang Yu-ch’eng (AD 954-1001) was demoted to Huang-chou in 999, he built a bamboo tower and was consoled by its acoustic excellence: “I thus built a small bamboo tower with two rooms. It is a good place to play the Qin, for the musical melodies are harmonious and smooth; it is a good place to chant poems, for the poetic tones ring pure and far; it is a good place to play Weiqi, for the stones sound out click-click.” When a stone is grasped between the nail of the second finger and the tip of the third – the traditional method – and placed on the board with confidence, a cheerful ringing note results. This sound was even more pleasant when mellowed and amplified by the bamboo tubes in Wang Yu-ch’eng’s simple, elegant tower.